This is Day 3 of the 5 Days to a Better Grocery Budget series. If you missed the previous posts, read Day 1 here and Day 2 here. Once you’ve decided on a grocery budget amount that works for your family, you need to set up some sort of accountability for sticking with that budget. This is key for the success of your grocery budget. You can’t just mentally kind of, sort of have an idea of a grocery budget for it to work. 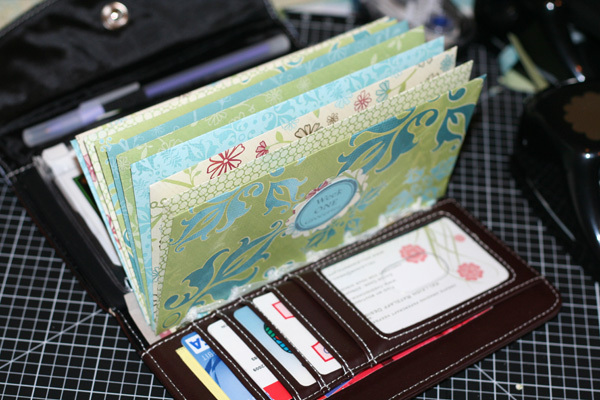 A cash envelope system is just that — you take out your allotted Grocery Budget amount in cash every month (or weekly or bi-weekly, depending upon when you get paid) and just take that cash to the store. The benefits of using cash are that you can’t go over budget. When the money’s gone, the money’s gone! It forces you to stick with your budget and to really analyze each purchase as you’re putting it into the cart. The drawbacks are that you have to mess with going to the bank or ATM to get cash — which can be a hassle for some people. In addition, some people find that they spend more or spend the cash on non-grocery purchases because they have it in their wallet and it’s “burning a hole in their pocket”. If messing with cash seems tedious to you, a great alternative is to use a Virtual Cash Envelope system through a program like YouNeedaBudget or EveryDollar. These apps allow you to set up your “cash envelopes” or budget categories and then deduct your purchases throughout the month. This way, you can always have a running total of how much you’ve spent and how much you have left in each budget category you’ve set up. The benefits of using this system are that you can keep better tabs on what you’re spending your money on and when you’re spending it and how you’re doing on your budget overall at a glance. It’s also nice because you don’t have to mess with sharing cash envelopes if you’re like our family and both spouses pitch in with grocery shopping and other shopping at different times throughout the month. The drawbacks are that you are swiping a card — which means that you can more easily go over budget than you can when you use cash. Plus, it’s more sophisticated than cash (i.e. you have to mess with inputting the data after each shopping trip and tracking how much you have left in each budget category. Overspending could be the result of a self-discipline issue. Or, it could be even deeper than that: you could be overspending because you are trying to fill a void in your life of some sort. When you are tempted to spend money that you either don’t have, isn’t budgeted, or is an impulse buy, start training yourself to stop and ask: Why? Why am I wanting to spend this money? What need am I trying to fulfill? Why do I want this thing or experience? What do I think it’s going to do for me? The more you can step back and ask, “Why?”, the more you’ll be able to get to the root of the issues and deal with those versus just trying to slap a bandage on surface problems — which will never resolve the issues longterm. 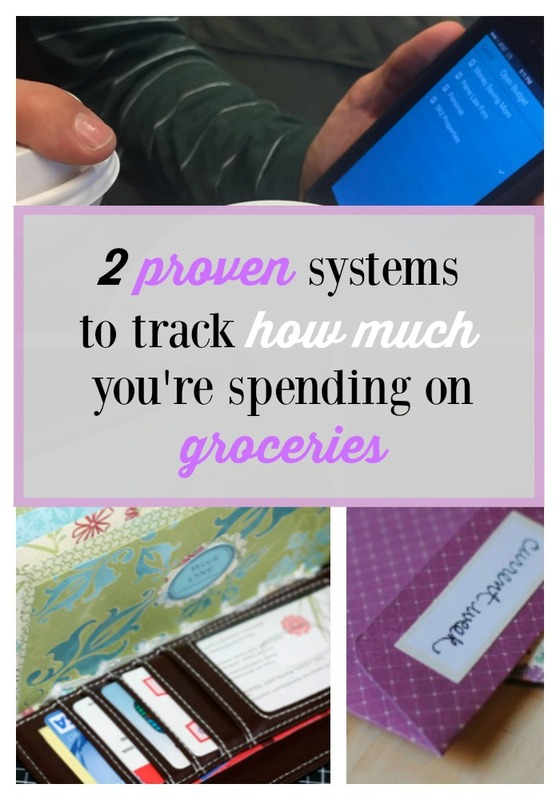 Do you use a system to track your grocery purchases? Tell us in the comments! We use YNAB but we have a number of categories within YNAB that use cash envelopes so monthly , we enter in all those at once. We haven’t had a problem remembering to put our envelopes in their designated place after shopping so it hasn’t been an issue that both my husband and I grocery shop. We’ve used cash envelopes over 8 years. Since we use our credit card for 99% of purchases (which we pay off in full every month), I can export the data to an Excel spreadsheet and create categories for each purchase for better filtering. It’s not exact, cause we purchase personal care items in same transaction as groceries (although if we wanted to be more exact, we could split up those items in a separate purchase). I don’t do this every month, but occasionally throughout the year to make sure we are on track, or if I start noticing trends in increasing spending on the credit cards…helps find the “leaks” in spending! We use Mint.com to help us budget. It imports are transactions and keeps track of categories we have set up. It also can send alerts if you are getting close to a limit. It has worked well for us so far! We started using YNAB this fall, and I love it. I don’t like carrying cash. I love that YNAB links to my accounts. I can use the app on my phone to see how much is left in my grocery budget category. If there is a great deal but not enough funds for me to stock up, I can look through my other categories and realocate. ? perfect. I hate budgeting. I don’t hate BUDGETS, I hate everything about the process of budgeting. I have tried so many methods over the past couple of years, trying to find a system that works–spreadsheets, programs, paper-and-pen, combinations of all three. The process of keeping track and being accurate in what you’ve spent and what category and how much is smart and how to balance it all–I hate it. It stresses me out. Alyssa–I’ve been there. What helped us was to simplify our categories and to develop a routine that included a quick check in time. So, for us, each Friday, I go through our receipts and bank account and log the purchases. While I try to account for every penny, I don’t let it stress me if we’re off by a little. It’s not the same as balancing a checkbook (for us)–that is a separate activity. And, while it is possible to over simplify, and therefore not know where your money is going, the addition of “miscellaneous” was helpful to us. Similarly, if i go buy groceries and at the same store buy an item that goes in the gift category, rather than try to separate out the cost, I just put it all in the “grocery” line, but then know that if we’re running low on grocery money, we can borrow the gift’s amount from the unused money still gift category. Hi Alyssa, I know what you mean. Personally, I find that budgeting takes more time than I can offer it, yet I can’t get away from it either or my family tends to start building up credit card debt. One thing that I know helps is to make things as simple as you can while still having a budget that is effective. Sometimes it helps to work with broader brushes, so to speak. So instead of having categories like personal care and cleaning and school supplies in addition to groceries, you could call them all “groceries”. Or call them all “items you buy at Walmart” (or etc). You know how your family operates. Or call food “groceries”, and all of the other every day purchases that keep you going “supplies”. If that is still too much detail to deal with, you could list out all the repeating required payments (rent, student loans, car payments, utilities….). Figure out how much you need monthly to cover those obligations. After the required stuff, set yourself a limit on your discretionary spending (whatever money you have leftover . Don’t itemize it. Just call it all “discretionary” or, if you tend to use a credit card, call it all “credit card”, and know that you can only afford to spend X dollars per month (no matter if you are buying light bulbs or winter boots or bagels or paying for the kids’ sport stuff…) after you have covered the required stuff. That frees you mentally to just basically lump it all into two categories – Obligations and Discretionary (or whatever you want to name them). This is still helpful. After that, a key would be to try to create an emergency fund on the side somewhere to cover the larger unexpected expenses (car repair, broken tooth, etc) to help you through rough times. We use a separate credit card for food than for general merchandise. Any time we want, we can log into that account to see how much we spent on food and where. We use mint.com and I LOOOOOOOOOOOVVVVVVVVVEEEEEEE it! We used cash envelopes for a long time, but it was so time consuming to go to the bank so often, figure out and get the correct denominations, keep the envelopes accurate, etc. I was also regularly having to go put cash back IN for amazon purchases, target red card purchases, my husband spending on the debit card (since I was the one who had the cash), etc. money was constantly getting shifted and mixed and I still wasn’t always sure where it was going. I love mint because it imports our transactions from our bank accounts, is intuitive, is very flexible and personalizable (make your own budget line names, set your budgets and whether individual budget money rolls over to the next month), and more. It’s so easy to split transactions. It’s so easy for me to check on the app and see what’s left to spend. You can set saving goals, and they are working in adding bill pay. I have saved SO MUCH TIME with mint. I also know much more accurately where our money is going since I can easily type a quick note about what was spent. Instead of wondering what I bought on amazon for $15, I can easily check and remember what I bought. Or if I wonder how in earth I spent all our toiletries money, I can just click that budget, see all the transactions, and scross through the notes. I love it. The time I spend categorizing transactions is a fraction of the time I spent twice per month trying to make the cash system work. Now that more of our purchases are being done online, it makes a lot more sense for us to use this method. It would still make a ton of sense for us to use our debit cards with mint even if we only shopped at physical stores. We love it! Thanks so much for sharing more about your experience with Mint! We have a separate grocery checking account. Our grocery budget goes directly from my husband’s paycheck into it every other week. I know exactly how much I have to spend and it’s worked great for us. There are times that I need some extra money for some special reason. For that, I just talk to hubby and we’ll do a transfer from our main checking account. That’s a great system! Thanks so much for sharing! I have just started using a virtual envelope system using a spreadsheet I set up in EXCEL. It is really easy to use as long as I write down every purchase and then transfer it. I find that doing this makes me think twice about spending as I know that I will have to go and write it down !! We have used http://www.mvelopes.com for years. It helps us a lot. We have saved a lot of money because we know just where every penny goes. They have a free version and one you can pay for. The free version has a limit on how many accounts you can link up. Thanks so much for mentioning Mvelopes! I’ve been using Dave Ramsey’s Every Dollar program. I use the free program. I think it’s pretty easy to use. There is an app as well, that I haven’t tried yet. will be trying that out soon! Thanks so much for your sharing your experience! Walmart carries items that span almost every spending category in our budgeting software. 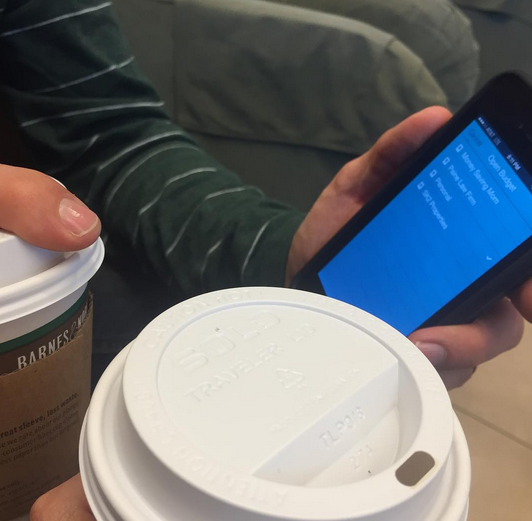 Plus, their receipts do not itemize and almost impossible to decipher, is there any app or the like that would make the process any simpler. For now, we check out by buying each category separately. It can be maddening. Have also tried the Walmart app.